Macquarie Ice Rink is the home of the Sydney Speed Skating Club, SSS. 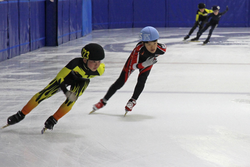 Australia's fastest growing speed skating club. SSS is made up of a dedicated group of volunteers who are committed to the growth of the sport and the development of our skaters. Our members include previous national champions and international representatives. Novice and experienced skaters are welcome. New memberships are open for payment now through this online portal.